One woman was an exquisite seamstress. Another an aspiring artist. A third had a keen eye for design. 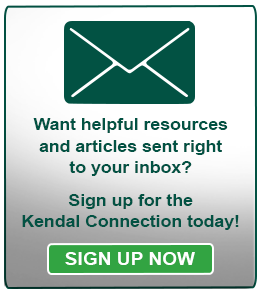 Every two years, Kendal residents share paintings, pottery, woodwork and other original items from their personal collections for a public display. Some of the 80 pieces in this year’s “Kendal Collects” are the work of professional artists. Most items, though, are cherished by owners because of their personal value. Meet three such owners, daughters who selected pieces for “Kendal Collects” that celebrate their mothers’ creative spirit. Displayed behind a glass case is a silk christening dress and slip hand-stitched by Helen Smith in 1924. The dress has tiny tucks on the front and sleeves, whitework embroidery and quarter-inch buttons. “It must have taken her nine months to make,” jokes her daughter, Eileen Dettman, one of four family members who wore the dress for their christening. The matching hat is missing. 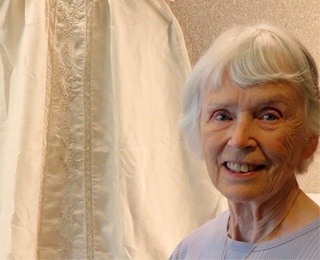 Helen made all of Eileen’s clothes, including her wedding dress. She was also a knitter. Eileen started her handiwork at a young age, too, knitting clothes for her dolls. “We used long nails instead of knitting needles,” she says. Later, as a ballet teacher, Eileen made costumes for performances. 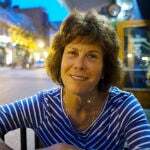 During a sabbatical to Scotland, Eileen learned how to make bobbin lace. She still has her sewing machine and does repairs, such as shortening pants, for other residents. As for the nearly 100-year-old dress, it is stored in archival tissue and kept inside an archival box. Every so often, Eileen hangs it up to help with the preservation. In high school, Jean Hartson was very interested in art and later majored in art at Colby Junior College (now Colby-Sawyer) in New Hampshire. Later, she designed programs and did calligraphy and other art projects for community organizations as she raised a family. After her husband’s death, daughter Kathy Caldwell encouraged her to take classes at the Cleveland Institute of Art. “I’m not good enough,” she told Kathy. When Jean died, Kathy went through dozens of boxes full of memorabilia and found a stunning silkscreen of a lily pad, made by her mother in 1942 when she was a high school senior. Kathy framed the lily pad and it now hangs in the front hall of her Kendal cottage. “She was very talented, but she never took credit for herself and she should have. That’s the sad part,” Kathy says. As for Kathy, her artistic talents lie in music. She plays the flute with the Great Geauga County Fair Band and elsewhere. Before coming to Kendal, Kathy lived on a small horse farm in Burton, Ohio, where she bred and raised Connemara ponies. She moved to Kendal two years ago with her therapy dog, Mylee. In the 1950s, Mary Margaret Evans was walking through a flea market in Kabul when she spotted a Persian tablecloth caked with spilled food. She stopped to buy it. “My mother had a very keen eye,” Janet Smith says. Her mother’s instincts were right. The tablecloth, made of fine needlework probably in the 1880s and owned by a wealthy Persian, was made of gold and silver threads on black silk with a red silk lining. It was a tent tablecloth, used in a tent to cover a low table laden with food. Underneath the table were charcoal stoves, and men would sit on the floor and tuck their feet under the table for warmth. Once at Kendal, Janet thought the tablecloth would be a great item to display in “Kendal Collects.” She pulled it out several months before the exhibit to consult with a resident trained in archival preservation, who agreed the cloth was “really extraordinary.” Janet had the top of the tablecloth repaired so it could properly hang in the exhibit. Now, when the tablecloth is moved back to Janet’s cottage, it will have a place of honor. “It will be hanging in my living room,” she says. To learn more about Kendal at Oberlin, call 800-548-9469 or 440-775-0094, or contact us here.